Last year I started running. I still hate it, yet I continue to run 2-5 times a week. I have a running group that keeps me motivated and makes me stick to my routine. It’s nice to know that even when it’s 25 degrees and all I want to do is hide under a blanket, my running friends will be there motivating me to still lace up and head out. 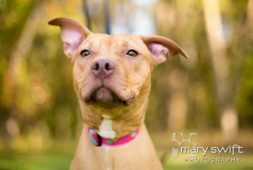 Fuschia is an adoptable Pit Bull in Baltimore, MD that could be your next running buddy! Are you a runner that is looking to stay motivated, or find new motivation that has been lost? Dogs make great running partners! What better motivation than that wagging tail when you lace up your running shoes? A lot of dogs can be great running partners, but you’ll want to find the breed that’s best for your running style. Weimaraner and Jack Russell Terriers are great for long, steady runs over 10 miles. Looking for a shorter run companion? You’ll want to look for a Pit Bull, Greyhound or Beagle. Are you a speed demon that loves running fast? German Shorthaired Pointers and Whippets are great dogs for speedy runs. If you’re more of a slow runner (like me), try a Standard Poodle. No matter your running style, there is likely the perfect running partner for you at your local shelter. You’ll be healthier, and you will be saving a life. What have you got to lose? Why not start your search now on Petfinder.com?